I just can’t seem to help myself 😀 I’m not complaining, but here I am – off doing another mystery that I squirreled away. Now I don’t do them all mind you .. but this one appealed to my sense of style and design. As usual, my cutting table looks like a war zone when I start to plot and start. For this one I wasn’t even sure what my background colour would be .. I tend to be at almost a critical shortage of that right now .. sooo I’m going scrappy with this one 😀 Granted I’ve ordered from Joann’s .. but by the time they got to cutting my order, they don’t have the 3 yards I ordered (a week ago plus), and I jumped on another great sale – and of course every fabric that I ordered – SOLD OUT! Where’s the justice in this world!?!?!? PFFT!! Ah well that just means that I have to stretch my creative colour muscles and see what I’ve got to work with. Now I had a few issues with this pattern; The fabric guidelines were vague to obscure – in a conversation with a lady at the company that sponsors this, she said she can’t wait to see what colours I come up .. my response .. Me either!! Ya’ll know how I feel about using a whole square to create a HST then do nothing with the resulting orphan .. well one step required that, so I reworked it to so I didn’t have that orphan 😀 And another step the amount said to make for one block part wasn’t all used .. so I basically printed out the final layout, counted the blocks there, and went from there .. even with these hiccups and whatnot .. now this could just be me missing vital stuff or just being quirky .. but this pattern is gorgeous and i’m glad that I’m moving forward on it :D.
Girlfriend, you are a much braver soul than I at this hour of the morning for both us! LOL Love your line-up, still working on getting mine lined–especially all 6.5 yards I need for the background! OUCHEE!! I will have to scrounge every scrap of white I can find, for sure! And I agree with the florals for this whole heartedly–very feminine and tasteful 🙂 Still to cut mine! 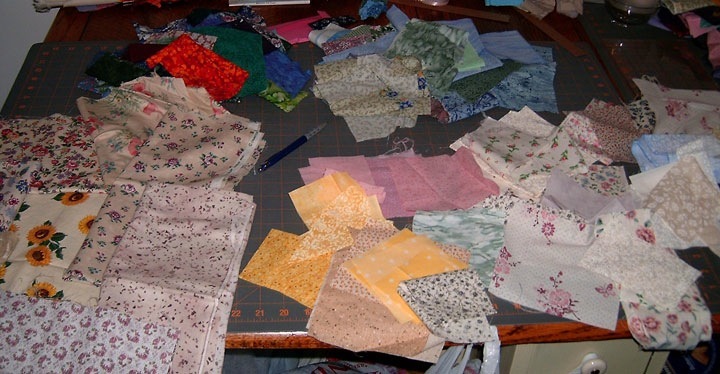 Good luck — I’m not one for mysteries…on second thought maybe all my quilts are mysteries because I don’t even seem to know where they’re going until I’m in the middle of them making decisions and changing my mind. I can’t wait to see what you come up with. I love that sunflower fabric. I used to have some. I think I gave almost all of it away.